If a male chickadee doesn't win daily song contests with rivals, he may return to an empty nest. WASHINGTON (AP) — The love life of a female chickadee could make a country music classic: "If your song don't pass muster, buster, I'm gone." The lady chickadee has a cheatin' heart, quick to find another lover if her mate fails to win his daily song contests with rivals. In effect, she decides that if her mate is a loser, he won't be the only papa in her nest, say researchers at Queen's University in Kingston, Ontario. Daniel Mennill, co-author of a study appearing Friday in the journal Science, said mates of high-ranking male black-capped chickadees are more likely to be unfaithful than are the mates of lower-ranked males. "Females are accustomed to hearing their high-ranking mates dominate a song contest," Mennill said. "It is quite a shocking event to their ears to hear them lose a song contest." When that happens, he said, the female will sneak out before dawn and meet with a rival male for a coupling. Then she flies back home as if nothing happened and continues to live with her partner. "These extra matings are just short copulations — about 30 seconds," said Mennill. The long-term partners "do remain mated, in a social sense." The effect of these extra matings is that some chicks in the nest have been fathered by some other male chickadee, he said. And the betrayed male apparently never knows. Mennill said he established by DNA analysis of blood from the chicks that one or two birds per clutch had a father than the one that raised them. Male chickadees are challenged virtually every day to a song contest with rival males. They use the contests to defend territory and nests. One male sings and the other then sings back in a competition that may last for several minutes. "If a male is very aggressive, he'll go through a set of routines where he will match the pitch and try to overlap the song of his opponent," Mennill said. While this is going on, the female is listening, gauging who is winning. If her mate loses, she remembers. Mennill proved the chickadee cheating by recording some of the bird songs and then engaging in a singing contest with a male bird. "The main effect is that the female is more likely to engage in extrapair copulations if the high-ranking partner was bested." "A few times I have seen a male follow the female and it did turn into a bit of a fight between the two males and the two females," said Mennill. "But usually these things are very quick and the female can sneak away and be back before her mate notices." The females of high-ranking males are most likely to cheat, he said. Rank among chickadees is established in the fall when the birds gather in flocks that will last through the winter. Somehow the birds establish an Alpha, or primary, male and female, a Beta, or second in rank, male and female, and so on. "There is an Alpha chickadee for whom the others make way at a food source," Mennill said. "The lowest ranking bird has to wait for everyone else." 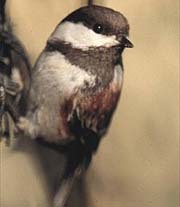 Even though chickadee partners may stay together for years, the birds do have a system rather like divorce, said Mennill. If, for instance, the Alpha female dies or is grabbed by a hawk, then the Alpha male becomes a nestwrecker. "Within 24 hours, the Beta female will divorce her partner and pair with the Alpha male, leaving the Beta male alone," Mennill said. "The females will do a lot of social changing in order to pair with a higher ranking male." Sounds like another country song. Copyright 2002 The Associated Press. All rights reserved.